Fiber optic Christmas trees are popular today mainly because they are so quick and easy to setup. This is especially so for those among us who don’t have a lot of time through leading a very busy life, or even just by pure choice. If you have decided that a fiber optic tree is for you, then your next step is to choose the color. The choice of colors can be many although when looking around it still seems like green is still the favorite color for many folk. Give a thought to what other decorations you will be adding to the tree. Whether you go for snowflake style Christmas lights, golden toned lights or colored garlands, some colors go better together than others. 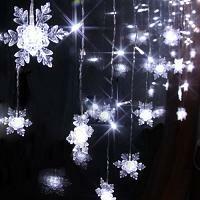 Fiber optics can be found in other types of decorations and are becoming more popular every year. Some examples are these little colorful fiber optic village ornaments and even complete Christmas village sets can be found . As an example, a red Christmas tree looks better when decorated with pink and green colors as would a pink Christmas tree look good decorated with a red and green color scheme. If green is your choice of tree color then sticking to shades of red but with white and blue also work well. I think that’s why fiber optic Christmas trees work so well as the colors mentioned are prominent in the fiber optic needle tips. p>Below I have listed 3 fiber optic trees that would be great candidates for the home or office. Two of the trees are green and the third one is a small novelty tree with a USB type power plug. p>A good example of a forest green colored fiber optic tree. p>There will be no need to do anything with this tree as it’s fully dressed. p>A fun item for home or office desk to add some Christmas atmosphere. My first selection of fiber optic trees is this 4 ft pre lit Christmas tree which is in a forest green tone. The green color would look great with a white Christmas tree skirt at the foot to hide any tree supports. It has a multi-colored wheel at the base used to shine through the bright colors through the 165 fiber optic branch tips. The mechanism is housed in a black stand styled as a plant pot to provide colors of white, purple, green, red, blue and amber. The tree is made pf a 2 piece construction with the branches being the normal hinged type. To apply power to the fiber optic display there is a 6 foot cord with adapter fitted and is UL listed to only be used indoors. The base pot sizes are – 5.25 inches High X 8 inches Wide. 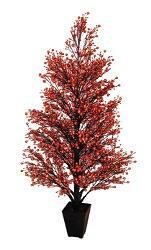 And the total overall height of the tree is – 4 ft tall with the widest diameter of the branches being 25 inches. 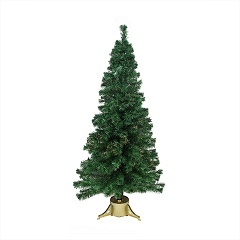 Reviews for this 4 ft pre lit Christmas tree are rated at 4.0 from the 5 stars possible being rated by 20 users. 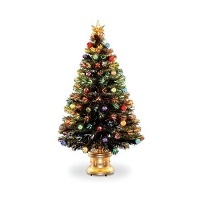 href="https://homeandgardencare.org/wp-content/uploads/2014/11/4-Ft-Fiber-Optic-Christmas-Tree.jpg"> Number 2 tree on my list is this 4 ft fiber optic Christmas tree by the National Tree Company which really goes the extra mile as far as show goes. 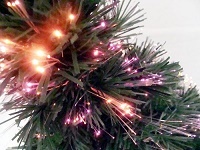 Apart from having the fiber optic lighted branch tips of which there are 200, they have also added an array of multicolored ball ornaments which also light up. To top it off (no pun intended), they have fitted the top of the tree with a star. OK, not a crystal tree topper as some big stores have, but a star nonetheless. The base has also been given the luxury treatment with the addition of a very attractive golden colored urn bowl to house the mechanics. Quick to erect and quick to dismantle is something that will suit a lot of folk. Simply slip it into one of these Christmas tree bags for storage when the festival period is over and all ready for next season. The sizes are: 48 inches High x 27 inches wide. The weight is 4 lbs. 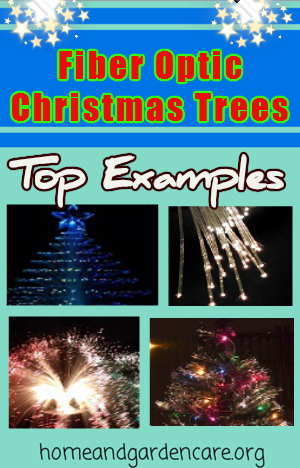 Reviews for these fiber optic Christmas trees as you would imagine are very good being rated at 4.3 from 5 stars coming from the 9 users who rated it. 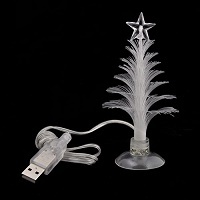 ref="https://homeandgardencare.org/wp-content/uploads/2014/11/Small-Fiber-Optic-Christmas-Tree.jpg"> If you’re looking for a small fiber optic Christmas tree that would sit on a desk at home or at work then this little gem might be just what you’re after. It is powered up through a USB port on your computer or other gadget you have with a USB port. Folk have even mounted these small pre lit Christmas trees in their car using a cigarette USB adaptor. Very inexpensive at around $5 its little wonder that they ran out of stock before, (back in stock at the moment). They make ideal little gifts apart from using yourself. There are 7 color changes in the fiber optic cycle and has a suction cup at the base for mounting purposes. See other colors in the cycle. 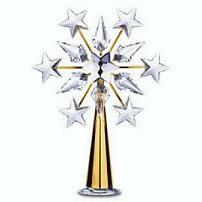 The sizes are: Tree height is around 4 3/4 inches to the top of the star. The length of the cable is a good 55 inches which should be long enough for most uses. Again very good reviews for this little fiber optic Christmas tree with a 4.4 from 5 stars rating left by 27 users who purchased the tree. Get all the details here. Hopefully you have seen something that suits what you’re looking for. They are fiber optic Christmas trees that I have discovered to be decently rated by the users which says a lot about products. They also offer good value and fun which Christmas is all about anyway. Click Here to See More Choices . Interested in purchasing a fiber optic tree 6 ft.